The Lyon's Tale: Weeeee!!!! I Love It! I'm mucho excited here. 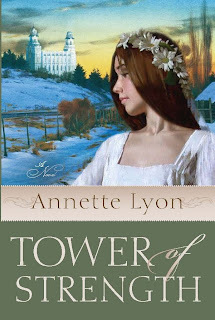 I wasn't planning on posting today, but something changed: I just received the cover for Tower of Strength! Opening the file for the first time is always nerve-wracking: will the cover be something I like, love, am indifferent to, or totally despise? It's pretty rare for an author to have much say in a cover or in the title (more on that Friday on my Writer's Journey series). So you kinda hold your breath and hope that marketing and you are on the same page. Since the vast majority of my readers haven't read it yet, I have to point out why it's so perfect. Before the book opens, Tabitha leaves Manti as a young bride (which totally fits, because doesn't she look like a bride?! I know!) And the book closes at Christmas time (which makes the winter scape fit). It's like symbolically morphing two periods into one. I'm not sure yet (because I haven't seen the credits), but the temple and the girl both look they're by the same artists who did the work on my three other historicals: Al Rounds is my temple artist (I know he doesn't do paintings just for my books; they're licensed after he's done them, but I'm claiming him anyway), and William Whitaker is the one who's painted all my girls. Suddenly this one is feeling real. I now have an idea of what it will look like when I hold it for the first time. It's no longer just a bunch of words on my computer screen and a story with fictional people wandering around my head, but an actual book. I just ate WAY too much chocolate in celebration. I need a drink of water . . . I love it too. I agree--seeing that cover makes the book seem all that much more real! Congrats! That looks awesome, Annette. Congrats! Hey, Annette, the cover is gorgeous! Way to go! I found you on Mormon Mommy Blogs, but have seen your comments everywhere. The cover looks great! congrats! It looks great! I'm excited to read it, and I would definitely love to do a giveaway. It would be so hard to have no control over a cover - I literally have bought and checked out books based on their covers alone. Covers are huge! And I love this one. It fits with the others so well. Hey, there are days in one's life where the amount of chocolate eaten is purely irrelevant - and I think you can count today! Congratulations!! I can't wait to go find it at Deseret Book! Lovely! I love it! I say eat more chocolate. Okay. So I have a suggestion for making the opening in Chapter two more shown rather than told, but I hesitate to share it with you. Who wants to have someone do that without soliciting it. So I won't. But I do. How cool...I can't wait to read it! See, it's going to press as we speak. As I type. Whatever. The opening chapters were seriously shortened and redone from the original (the first chapter is actually what's left of THREE chapters--they wanted it to get into the story quicker). So they might very well feel more rushed (read: more told rather than shown) than would be ideal. In the future, maybe you could be a beta reader and give me all kinds of great feedback. Let me know! Yes, it really is beautiful. Sorry to even suggest something. Beautiful cover. Is this book one for which I will have needed to read something else first? Because, I'll do it. Just let me know. Package is on the way. Anon, I obviously misunderstood the question. Feel free to e-mail me about Spires. (I'll have to crack it open now to remember where Ch 2 starts!) I'm always open to writing discussions, and of course I want to improve. No apology necessary. Beautiful cover! I can't imagine how exciting that is! Nope, it never gets old! I really like the blues and greens in this one. Now you know what your main character actually looks like! Wow! It's really lovely. I can't imagine having no control at all about how they dress your baby! It looks beautiful. You've been lucky to have such wonderful covers. The cover is great. I can't wait to read the book. LOOOVE it! The colors are beautiful, the girl is darling and it fits the tone of your other books so well. Congrats, Annette. Do you have a release date? Very nice Annette. It looks beautiful. I am so very happy for you. Can't wait to give these out to some friends. It is so cool seeing your name on the front. It's like I want to say, I know that awesome lady :) Congrats and eat it up. It's beautiful! I love your excitement. :) I can't believe I blog along with a totally real author :) You rock. It is gorgeous! And, yes, it does look just like a wedding dress! I hated the cover of Miss D when I got it--it just doesn't say anything accurate about what is inside the book. I had been asked what I wanted and I said anything with roses but this was not what I expected. It has really grown on me. My dad, however, hates it. He said, "I know of one person who really doesn't like your book. The one who did the cover." I love it! She's beautiful, and I like the flowers in her hair --it makes it stand out more than your other covers. Does that make sense? I am so excited for you, Annette, and I can't wait to read it! Lovely! So excited for you, and not even a little bit jealous. Well, ok maybe a leetle bit, or you know, A LOT! Hey, you're coming to my house Thursday! The cover is lovely, and how great that it ties in with the story so well! Very nice! Looking forward to reading it! It's gorgeous! Love the colors, too. It IS lovely! Congratulations. How interesting that the author doesn't have much (or anything) to do with the cover art! Wow. So glad you have been happy. I really love the art on all of your historical books. How exciting! I love the picture too. Is this book completely separate from all of your other books, or would it help to read any one of your books in particular to understand the background on this one? Congrats. It is beautiful. I'm excited to read it. Are you going to have a book signing? I want to get mine signed. I will have signings, I'm sure. No clue on the schedule yet, though. I'll be sure to post it here. I'll have signings right before and on the weekend of General Conference, I imagine. It'll be fun to see you! It is breathtaking! I love the smoothness of the colors ... what a moment to capture! IT'S PERFECT! I love it and I am so excited for you!!!! 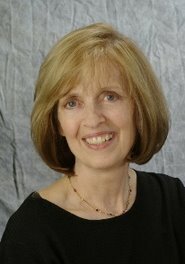 I just had the opportunity to review your new book for Association of Mormon Letters. I loved it! The cover was beautiful and the story inside was just as great. Thanks for a great read! MommyChickadee, Thank you so much! I'll look forward to seeing the review. WNW: Banish the Paranoia, Literally.